Nutro Wild Frontier Wet Food for Adult Dogs is a range of complete and balanced recipes containing only the best quality ingredients, for dogs weighing between 5 and 20kg. 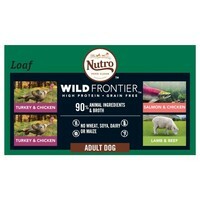 Designed to imitate the natural diet that your dog’s ancestors would have enjoyed in the wild, Nutro Wild Frontier diets contain high-quality protein sources like Salmon, Chicken, Beef, Turkey and Lamb, and will provide your dog with all the energy and nutrition they need to play out their wild instincts. Nutro Wild Frontier Wet Food is perfect for combining with the Nutro Wild Frontier Dry recipes and also contains a careful balance of carbohydrates to meet your dog’s essential needs, and satisfy their natural craving.